Detailed Scheduling heuristics are very good at what they do – a reliable tool to finitely sequence operations by sorting operations based on specific sort sequence criteria. This may be sufficient for many organisations for most of their Scheduling problems, however this is fairly rigid, specifically when schedules are fixed within the short term to allow stability for the schedule communicated with manufacturing. This is commonly referred to as the Fixed Horizon, or in product terms, the Planning Time Fence. Many companies, for example within FMCG, Chemicals or Life Sciences industries, like to maintain a cycle of products over a particular period of time. This cycle could be defined by a sequence of products being grouped by one or more common attributes. Over a planning horizon, this cycle can be repeated several times. 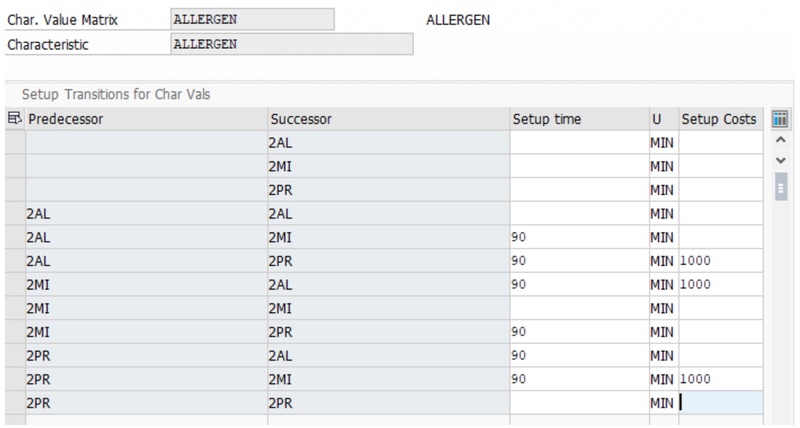 The need for grouping could be due to constraints such as allergens, or the need to provide the most efficient plan in terms of complexity of changeovers. As a sequence of operations starts to fall within the fixed horizon, there is a need to maintain and continue the same preferred sequence of operations outside of this fixed horizon. Where SAP's APO Production Planning and Detailed Scheduling (PP/DS) heuristic fails however, is to continue this sequence following the fixed horizon. It simply begins the sort sequence again based upon the sort sequence rules which have been defined. where the colours are attributes associated with individual products to be manufactured. The first sequence (a) is obviously undesirable, since it always begins again after the fixed horizon with the first colour of the sequence. This would reoccur each time the PP/DS heuristic runs. If this were a nightly plan, this could result in some products at the backend of the preferred sequence being planned sparsely as preference would always be given to those at the frontend of the preferred sequence. The second sequence (b) is desirable for a lot of industries previously mentioned. This follows the operations scheduled before the fixed horizon and continues that same sequence which allows effective cycle planning. How do we use the tools available within PP/DS to arrive at the preferred sequence while also considering the plan within the short-term fixed horizon? One potential option would be to consider block planning – which involves the assignment of product attributes to specific time blocks, ensuring that orders for specific products can follow a specific cycle. For some FMCG / Life Science companies this can be seen as inflexible, especially where the specific time block for which an attribute is assigned should vary based upon the demand and lot size of other products. A second option would be to develop a custom heuristic algorithm to achieve this. This would require ABAP development, but could be written in such a way to consider the sequence before the time profile which has been selected. If designed correctly, this would be reliable, but the downside of this would be the extra resource and time required for this to be specified, written and tested. A preferred standard option may be to use the PP/DS Optimiser. People often think of the PP/DS Optimiser as a multi-problem solver. It uses weighting of multiple Objective Functions to achieve the most cost-effective plan in the time it is allowed based upon costs. What few people actually realise is that it can also be used to drive a pretty reliable preferred sequence considering the plan within the short-term fixed horizon. One of the ways of achieving this would be to assign a particularly large weighting on Total Setup Times within the Objective Function. A prerequisite of this is the use of a Setup Matrix, which can be either manually maintained based on setup groups or generated based upon product characteristics. In reality, the use of Setup Times to achieve the desired outcome is only really reliable if your preferred sequence was 100% driven by time taken to change from one operation to another. In the case of a lot of organisations, this is not entirely the case. Other factors may come into play, such as difficulty of the changeover, use of the same tooling across multiple product groups etc. In short, companies like to follow a preferred sequence for a number of reasons. With this in mind, a far more reliable method is to consider using particularly large weighting assigned to Setup Costs. Many people think of costs as being monetary – EUR, USD, GBP etc., but they should be considered as arbitrary – as large as they need to be to solve the problem in question. By assigning zero cost in the setup matrix to those transitions which are desirable, and assigning large costs to those which are not, in addition to setting the Optimisation Horizon to run from current date, but ensuring planning intervals are clearly defined, means that the preferred sequence can be easily and effectively achieved with very little maximum runtime (can be a few minutes or less depending upon other aspects of the objective function), whilst also considering the plan within the fixed short-term horizon. Standard DS Heuristics and Reschedule functions within the Detailed Scheduling Planning Board serve a purpose and are effective within the right circumstances, but in some cases may be constrained, specifically when trying to maintain planning cycles as is often the way of working for FMCG and Pharmaceutical organisations. There are other options available for this, including the PP/DS Optimiser which can maintain preferred sequences and cycles with minimal effort and without the need for ABAP development. If you have any queries or comments on this topic, please don't hesitate to contact me on chris.curtis@olivehorse.com. Olivehorse Consulting have a wealth of experienced Supply Chain Consultants who specialise across multiple industries and technologies, and can provide you with advice and the correct solution to fit your business model.